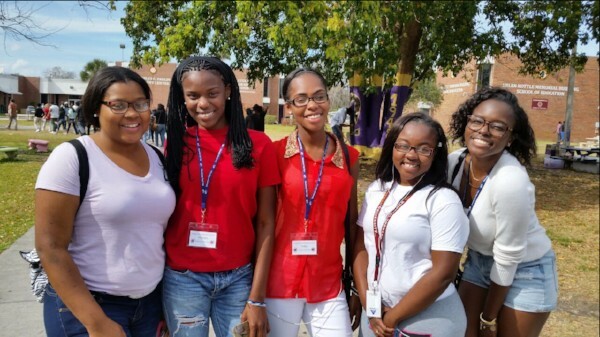 Homestead Senior High College Club students visit Bethune-Cookman University. For most students in Miami-Dade County Public Schools, one of the largest and poorest districts in the U.S., attending college remains a dream. The Education Fund’s SmartPath to College Program (formerly Citi Postsecondary Success Program, CPSP) is an initiative that aims to embed a college going culture in high schools, empowering low-income and first generation students to successfully prepare for college and career. In 2008, the Citi Foundation tapped The Education Fund as one of only three organizations in the U.S. to receive a $600,000 challenge grant as part of a new initiative called the Citi Postsecondary Success Program (CPSP). Three diverse high schools were chosen to participate; all struggling to keep students on track from ninth grade to college. After a successful five-year pilot program, CPSP evolved into SmartPath to College. In 2018, SmartPath expanded and now serves five senior high schools. Miami Beach Senior High students attend a state-wide college tour. Asset Mapping is a research based gap analysis strategy used to inform and guide the program. Workshops are held each year where schools’ staffs identify missing or not fully implemented educational strategies that prepare ALL students to pursue postsecondary education. Schools then design and implement solutions to prioritize and address gaps. College Clubs serve students in grades 9-12 providing targeted instruction to students with emphasis on developing academic and college readiness skills. College club lessons cover a wide range of topics including college research, essay writing, test-taking skills, and improving study skills. Tools such as career evaluations are also used to help students realize the importance of graduation in order to achieve a college education. Our SmartPath Guide to College Clubs provides a collection of lessons, tools, and resources all faculty members may utilize throughout the school year to inform and prepare students for success in college and career. Contact the program director to learn more. College Field Trips allow students in 9-12 grades to travel outside their own neighborhoods, many for the first time, to experience life on a college campus. These visits prove vital as they allow students to gain first-hand knowledge of college and include workshops on academic expectations, careers, student services, and financial aid. College visits can be to local colleges and universities, as well as out-of-county and state. FAFSA Marathon Workshops are critical in providing information to access federal student aid and scholarships. Through a collaborative partnership with Miami Dade College, college financial aid staff work one-on-one, in schools’ computer labs, helping hundreds of parents and students complete the FAFSA (Free Application for Federal Student Aid) application. Engaging parents is crucial as many do not realize that college is a viable financial option for their children. This is significant as research shows that FAFSA completion by first generation and/or economically disadvantaged students greatly increases their chances of going to college.